In this article we will look at the steps to enable AWE Option in SQL Server. When enabled, the Advanced Windowing Extensions gives the ability to SQL Server to utilize Memory more than 4 GB. AWE enabling for SQL Server is valid in 32 Bit Systems only, on 64 bit systems AWE is not required to be enabled. In the SSMS, right click on the SQL Instance in Object Explorer, and select properties. the following Properties Dialog Box is displayed. 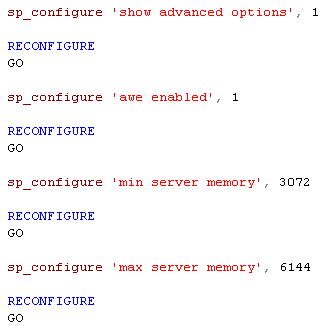 In the left Pane of the Box, Select the Memory Page and Under Server Memory options check the box as shown in the picture below to use AWE to allocate memory. You can also specify a Minimum and Maximum Memory SQL Server can utilize on the machine. So that incase of Memory available to SQL Server it does not complete utilize and resulting in no or less memory to the Operating System and other application running on the Server. Select OK in the Properties page. The change in the setting will not be effective upon restarting SQL Server. perform to enable AWE option. As always, I suggest referring other technical information before enabling AWE and other system settings that need to be enabled on the Server for this to be successful, such as enabling /3GB switch or /pae switch in Boot.ini etc. Cursors in SQL Server enable you to work with each of records in a record set, so that you can sequentially work with those records and carry out the required task. The best example that I can recollect to quote here is when you have a table with 100 rows, with one of the columns as email address. You are required to send an email to all valid records in that column and each record is some way or the other has its own condition, then a Cursor would be a good way to implement this. What cursor does is, it enables you to fetch the data into the memory and then for each of the row in the data set, you can look at the row, can implement any custom logic that is needed and move on to the next row until you reach the end of the records. There are different types of cursors available and based on the one you choose, you can actually move back and forth with the records. One other example I can give is, when you need to run a backup for all the databases in a SQL Instance, it is very easy to implement using cursors and has been used by me and many SQL DBA’s before the introduction of the DTS and SSIS technologies. That is the main benefit of cursors, but the flip side to it is, they are avoided in situations where the dataset is large, due to performance issues with cursors. Since they have this unique ability to traverse through the dataset, they occupy a high amount of memory in the Server. You should be able to find many examples on this topic and I shall try to publish an article with more details in one of my next blogs. By default, SQL Server maintains a minimum of 6 Error Log Files and each time the SQL Server is restarted, the Current Active Log File is recycled and new one maintained. The Error Log Files are stored in the “Microsoft SQL Server\MSSQL.1\MSSQL\LOG\” Directory. Monitoring the Error Log Files is very important since it displays vital information regarding the Server. Some of them are security related login information, Logins info such as Failure Logins or Failure and Success Logins etc are written based on the option chosen for the Instance. Other information reported includes Changes in Database Settings, Database backup related information; both successful backups and failures are reported. Apart from those mentioned above, SQL Error Logs contains the useful info when a SQL Server does not start and what’s causing the failure to start. 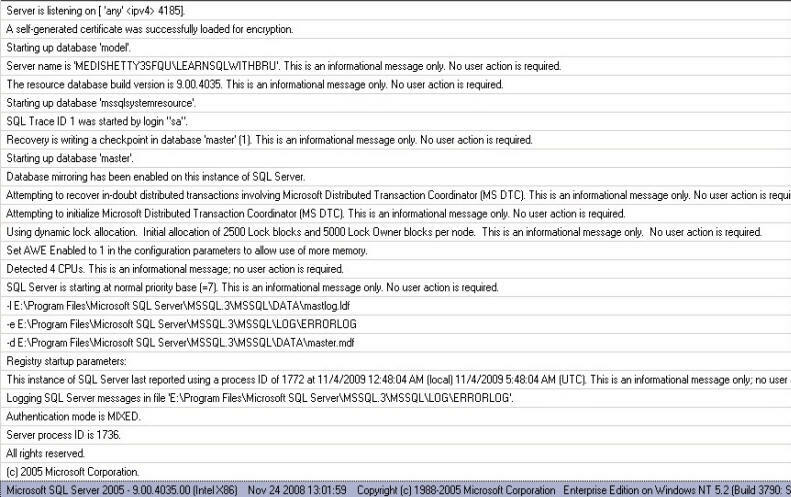 There is a lot more information displayed in a SQL Server Error Log, a sample screen of what are the messages displayed upon SQL restart is displayed in the picture below. The default value of 6 Error Logs can be increased but cannot be decreases. To configure a higher number of Error Logs, follow the Steps as described below. 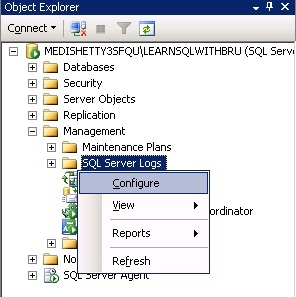 In the Object Explorer of SSMS, navigate to the Management Node and right click on SQL Server Logs and choose Configure as shown below. A dialog box is displayed and the check box beside for Limiting the Number of error log files would be unchecked by default. Check that and select the desired number of log files in the range between 6 and 99 and click the OK button (Not displayed in the Picture) to save the changes. A restart is not necessary for the changes to effective.